ONE of the most significant symbols honouring Pope Francis’s historic visit to Ireland last year is to find a permanent home in our diocese. Bishop Denis Nulty has announced that the processional cross used at the papal Mass in the Phoenix Park last September has been donated to the diocese of Kildare and Leighlin. Bishop Nulty was speaking ahead of the annual Chrism Mass in Carlow Cathedral on Monday 15 April at 7.30pm. The bishop said he was honoured that this cross, made by local artist Anne Murphy, had been gifted to the diocese by Archbishop Diarmuid Martin and the World Meeting of Families. Bishop Nulty remarked that the donation was in recognition of the “tremendous involvement of a huge number of people from across the 56 parishes of the diocese in the World Meeting of Families held in Dublin last summer, as well as in many events leading up to it”. Commenting on this historic moment in the diocese, Bishop Nulty expressed his delight that the cross will be processed into the cathedral for the first time by Anne Murphy at the Chrism Mass. 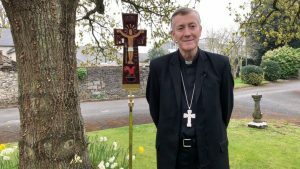 “I am sure that the people of Carlow and across the diocese will welcome this processional cross in our cathedral and in many of our churches at significant local celebrations for years to come,” he said.